While there are plenty of ways to explore the wild west, none are quite as interesting as traveling with the famous (and sometimes infamous) Annie Oakley. For one, when you're riding out to see the famous Teton Mountain range with this sharpshooter as your navigator, don't expect to stop at overpriced roadside diners for greasy hamburgers. You'll be making pit stops to let your travel companion take down a few squirrels for some wild rodent stew. And don't expect to stop at Deadwood South Dakota without a million anecdotes about the drama between Wild Bill Hickock and Calamity Jane. So, you could travel the old west like any other tourist or you could take a chance, see what happens, and saddle up with Annie Oakley. Just make sure you leave room in the trunk for her rifle! Become a charming symbol of classic western lore when you're dressed as Americana folk hero, Annie Oakley. 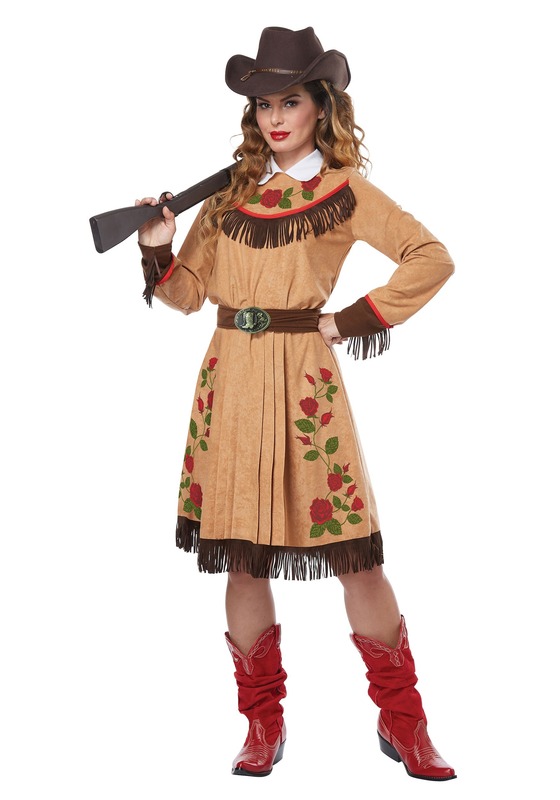 Her dress is a light buckskin color with fringe along the chest, wrists, and hem. As in the famous photos that she took in the 1800's this dress has wild roses climbing up the skirt and along the bodice. Because of her epic skills, Annie Oakley was hired by Buffalo Bill, adopted by Sitting Bull, commended by the Queen of England. In an age when women were expected to stay silent, she stood up for equal pay and women joining the armed forces. And while you might not be a world-renowned sharpshooter that will go down in history, you can look just like our girl Annie! Want to polish off your look? Throw on a cowgirl hat, a pair of riding boots, and get yourself one of our prop rifles and you'll be ready to go! Just be sure to throw us a free ticket if you're putting on a show.